As a youth soccer coach of course you’re committed to helping players learn and develop skills. But one of the keys is making it happen without one of those dreaded ACL injuries wrecking a child’s season. Soccer poses injury risk to the knee due in large part to the varied movements players must perform all game long: the constant accelerating and decelerating; the stops and starts; the hard cuts, often at awkward angles; all which place strain on muscles, joints and tendons. And can lead to devastating consequences. Couple that with players moving incorrectly and knees take on more stress – and greater risk of injury. 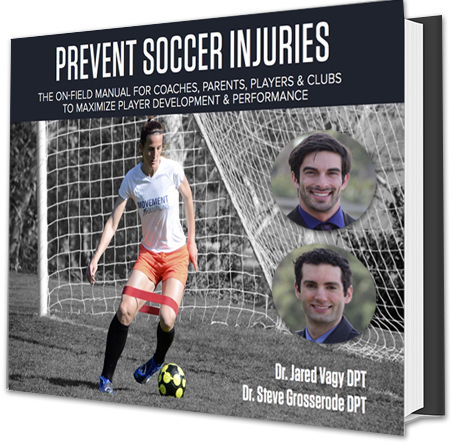 Grosserode and Vagy sifted through mountains of existing research concerning soccer injuries; they gathered feedback and advice from the nation’s top collegiate soccer coaches; and they utilized their own knowledge and expertise through years of working with world champion, Olympic and professional athletes, to create what they call a “three step movement solution” that is the basis of their book.